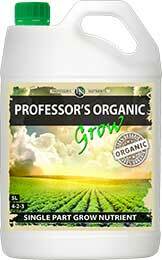 The Professor’s Organic Nutrient is a premium 100% Organic base nutrient. This unique formulation has over 72 different macro and micro nutrients, vitamins, minerals, Amino Acids and natural hormones which deliver the perfect NPK for growing and flowering crops. Organic fertilisers release nutrients slower then synthetic liquids, which eliminates the risk of over-fertilisation. This slow release of nutrients also means they are available for a longer period of time. Organic fertilisers also improve soil quality by increasing its ability to hold water and nutrients. Organic fertilisers add natural nutrients, feed important microbes, and improves the soil’s structure.